Hill and Wang, 9780809095438, 384pp. One of The Wall Street Journal's Best Non fiction Books of 2011. From modest beginnings as a tea shop in New York, the Great Atlantic & Pacific Tea Company became the largest retailer in the world. It was a juggernaut, the first retailer to sell $1 billion in goods, the owner of nearly sixteen thousand stores and dozens of factories and warehouses. But its explosive growth made it a mortal threat to hundreds of thousands of mom-and-pop grocery stores. Main Street fought back tooth and nail, enlisting the state and federal governments to stop price discounting, tax chain stores, and require manufacturers to sell to mom and pop at the same prices granted to giant retailers. In a remarkable court case, the federal government pressed criminal charges against the Great A&P for selling food too cheaply—and won. 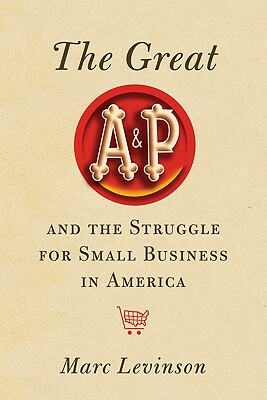 The Great A&P and the Struggle for Small Business in America is the story of a stunningly successful company that forever changed how Americans shop and what Americans eat. It is a brilliant business history, the story of how George and John Hartford took over their father’s business and reshaped it again and again, turning it into a vertically integrated behemoth that paved the way for every big-box retailer to come. George demanded a rock-solid balance sheet; John was the marketer-entrepreneur who led A&P through seven decades of rapid changes. Together, they built the modern consumer economy by turning the archaic retail industry into a highly efficient system for distributing food at low cost. Marc Levinson has a gift for discovering business history stories that cut to the heart of how industries are transformed. He did so brilliantly with the award-winning "The Box: How the Shipping Container Made the World Smaller and the World Economy Bigger," which was short-listed for the 2006 Financial Times and Goldman Sachs Business Book of the Year Award.